When we lived in Essex, we used to take bike rides to explore the parts of the North Shore we never saw as college students. One day we stumbled upon a gem, right near our apartment, Walker Creek Furniture. 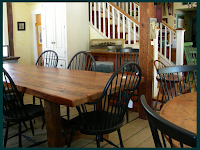 It is a fantastic old barn full of the most beautiful furniture we have ever seen. Everything about it is quintessential small town New England and very much "us." Now that we are a bit more settled, we have begun to hunt for a kitchen table. 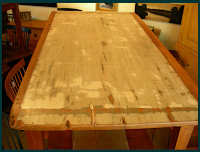 As we go about our search, we are continually brought back to Walker Creek and their amazing furniture. As you can see from the photos above, there are some beautiful pieces at Walker Creek! And, we basically like them all! Despite our obvious attraction to these tables, we also have convinced ourselves that we will find THE table here in the DC area. 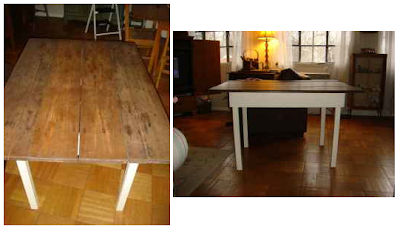 So, we have scoured stores and continually check CraigsList...until we found: Our table! Option # 1: We can take the legs off and get new ones (that look old) to bring it to the correct hight. Option # 2: We cut down the existing legs to make it a coffee table. We would also paint them a dark muted brown to blend in/disappear so the top is the focal point.